What’s the best RV generator for you? Well, that’s a difficult question to answer until you determine what your requirements are. Everyone has different needs depending on their RV and how they intend to use it so this article will provide you with a comprehensive education on what you should know before deciding on the best RV generator for your money. Later in the article we give you some recommendations for specific generators that are well worth your hard-earned money. Always be prepared for your RV travels. A generator is essential. RV’ing is a hobby for some people, while for others it is a way of life. Modern RV’s are outfitted with all the features and amenities that you would normally find in a fully furnished house, meaning that they have become more than just recreational vehicles. You could even live your life out of an RV, and roam the entire country at the same time in your lavishly accessorized motorized home. Microwaves, refrigerators, flat panel televisions, home theatre audio systems, gaming consoles, personal computers, sofas and couches, queen or king sized beds, modular kitchens, central air conditioning, heated water, washing machine, etc. – you can find all these amenities inside a fully outfitted modern RV, meaning that it is basically like having a house on wheels. But one thing hasn’t changed between your home and the RV – you still need electricity to run all those appliances. You have one of two options to supply power to your RV appliances – you can either plug it into a power outlet at a state park or camping ground designed for RV owners, or you could carry your own RV generator with you inside your vehicle as you go on a ride. 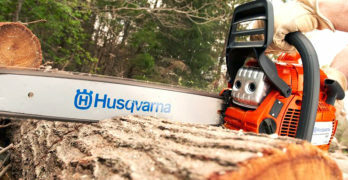 The first option is extremely convenient and does not require much planning or setup work, all you need to do is plug your RV into the external power outlet, via a pre-installed power delivery cable that is already present in your RV, or some sort of extension cord that you can easily find in any hardware store. Has boost feature allowing you to start demanding devices easily. However, external power docks for RV’s are not found everywhere, rather they are mainly situated on specific camping sites and state parks, or some race tracks that have RV parking grounds in them for people who choose to drive over in their RV’s to watch the race. Any real RV owner will tell you that they use their RV for much more than just state park visits or weekend camping trips, and in fact most RV owners go boondocking several miles away from any sign of civilization, or might even live inside the RV when they go to visit a friend or relative on holidays. And that is where a portable generator might come in handy if you wish to enjoy all the comforts of a modern home inside your vehicle. In case you plan on visiting a campground that has no pre-installed power outlets for RV’s, you’re in deep trouble if you haven’t bought a portable generator with you. In this article, we discuss on how you can select the perfect RV generator for yourself, based on your specific use case and needs (since no single generator model is right for everybody, just like one shoe size does not fit all). But before we talk about the technical stuff like how to size your generator and all the features that you should look for, we need to get some concepts cleared out first. Like what the difference is between a conventional generator and a RV generator. Then, we shall also talk about the various steps that are involved in choosing the right generator for your RV, and discuss about some must-have features in a RV generator. Finally, we shall end the article with some detailed reviews of a few extremely popular RV generator models that are highly acclaimed by RV owners across the country. By reading these reviews you shall get a fine idea of what to look for in a good RV generator, or you could also choose to purchase any one of the RV generators that we have reviewed in the end of this article. Remember, choosing a generator is not a difficult task at all, provided you know what to look for. There are hundreds, if not thousands of generator brands and models out there, and every manufacturer will be running around claiming that their generator is “THE ONE” for you. 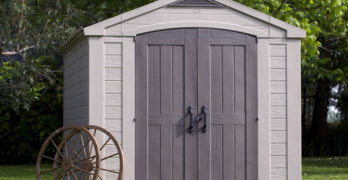 But you as the customer need to see through the petty marketing tactics and twisted specifications, and for that you should know how a generator works and why a certain feature is more important than another. Which is why, we shall inform you about everything that you need to understand about purchasing an RV generator in this article, so that you can make a well-informed buying decision and enjoy the time that you spend in your RV instead of having to constantly make compromises and dwell in frustration because you purchased the wrong generator. So, without any further ado let’s dive right in, shall we? In order to understand why you might need a generator for your RV, let us examine a few use cases that you will most likely encounter if you own an RV, or plan to purchase an RV anytime soon. These scenarios should give you a good insight into the usefulness and versatility of an RV generator, and why it is one of the most essential add-ons for any RV. Let’s be honest, most of the truly scenic and beautiful campgrounds are provided with minimal facilities, and you are expected to bring all your essential stuff with you such as cooking equipment, backup power sources, etc. That means you will need to bring a generator along with you if you plan to use the electric grill or microwave on your RV for preparing food. Unless of course, you plan to cook on a campfire like true survivalists. While cooking in a communal pot around a campfire can indeed be fun, you need the proper training and supervision to rig up a giant ball of flame in the middle of an open jungle or plains. Honda makes some of the best generators on the market. Quiet and reliable. Besides, most large natural reserves and campsites might even require that you possess the appropriate license to setup a campfire. And unless you went to scout school or have a camping instructor guiding you, it is highly unlikely that you shall be able to set up your own campfire. Which brings us back to the main point – you need to use the microwave oven, stove, or countertop grill of your RV to prepare any food that you bought along with you. And we are going to assume that the cooking equipment in your RV is powered by electricity, especially the microwave and electric grill (most mid to large sized RV’s have electrically powered cooking equipment in them). The grill and microwave can be used to prepare anything from barbecue to pancakes and whole roasted chicken or turkey, or even pizza and pastry (we’ve never tried making pizza in the middle of nowhere, but know for sure that it can be a lot of fun). So, if you have all that expensive cooking equipment lying around in the RV, it would be a shame to let it all go to waste and eat canned food instead on your exotic camping trip. Often in holidays season, you will find that visiting the home of a familiar friend or relative might not end up going the way that you had planned it. You see, you’re not the only one who’s planning to visit friends and family during the holidays, and naturally other guests will also be there with their respective families and acquaintances. And unless your friend or relative is a super-rich person with a ginormous 20-bedroom villa and a posh outhouse, space can become a problem. But let’s say you visited the house in your RV. Why not use the RV as your resting place for the night, while you can spend the day out enjoying with your friends and family? You could use the RV as a second home if you wished, that way there would be no space issues and everyone would be happy. You have your privacy, and can choose to get away from all the hustle and bustle that comes with a crowded house during holiday season. But surely you wouldn’t want to spend that time in the RV if you didn’t have a functional TV, fridge, or air conditioning unit, right? Like, who would want to spend the entire day or night sweating it out inside a metal box eating canned food with no TV for entertainment or refrigerator for refreshment? Besides, what if you needed to charge your smartphone or use your laptop for some urgent work? Surely there will be no free outlets available inside the house, since everyone else and their children will have it all occupied. Don’t get stuck in the middle of nowhere without a generator. Taking the open road is a wonderful feeling of freedom, but be prepared. The solution is extremely simple – just get a portable generator for your RV and enjoy a chilled bottle of beer in your RV while watching your favorite sports channel or movies on the TV (and you also get to use your smartphone or laptop whenever you want). Hang out with friends and family during the day, and work or chill out in your RV during the night – this way you can stay at your friends or relatives for much longer than it would have been possible if you didn’t have your own separate mobile home. Let’s assume that both your TV remote as well as AC remote use AAA batteries. On a hot summer night when you switch off the TV and go to sleep, you suddenly realize that the AC remote is not working because the batteries are dead. Naturally, the next thing that you do if there are no spare AAA batteries lying around is, you pop out the batteries from the TV remote and put them into the AC remote, because while you don’t need the TV, you surely need the AC as you’re about to sleep on a hot summer night. Why are we talking about TV and AC remotes? Well, think of what you can do if a power outage occurs in your area and you have no backup generator for the home, but happen to have a RV generator lying in the RV. Naturally, an RV generator is not that different from a normal generator and both can generate 120V AC power to run the appliances in your home. So, when a natural calamity strikes and you don’t know how long it will take the utility companies to get their stuff together and repair the main lines, you simply connect your essential home appliances to the RV generator. Any decent RV generator with more than 2000 watts of capacity packs enough juice to run your refrigerator, TV, personal computer, water heater, and lights at the same time. These are the essential appliances that you need to be able to use during a power outage or grid failure. If your RV packs a bigger generator though, something with more than 3000 watts of continuous power delivery capacity, you can even run the air conditioning system and electric grill with it. Both RV generators as well as conventional generators are designed to do the exact same thing – take mechanical energy generated from combusting natural fuel, and convert it into alternating current (electricity, like the kind we get from our mains supply) for usage by electrical or electronic appliances. Now, you have several types of generators, but they can all be broadly categorized into either DC or AC generators. DC generators produce pulsing direct current while AC generators produce periodically alternating current waves, or alternating current. The appliances in our home may be powered by either DC or AC current, but most use AC which is why the mains supply that we receive at the walls is AC. The way a conventional generator works is, it has three main parts – the engine, the alternator, and the voltage regulator circuitry. The engine is fed by the fuel tank or external fuel line, and the rotational motion generated by the engine moves the rotor in the alternator, resulting in a flow of AC current from the terminals of the alternator, and this current is then fed to the voltage regulator which irons out all the impurities such as spikes, jolts, etc. to deliver stable 120V/240V AC power for use by electrical/electronic appliances. The RV generators however, use a more complicated internal layout as well as some extra modules that you will not find in a conventional generator. Basically, most RV generators can be divided into two categories – Portable RV generators, and Fixed RV generators. Portable RV-class generators are usually inverter generators with modified motors and special sound muffling equipment installed to greatly reduce the noise emissions. Fixed RV class generators are those that are fitted into a special generator compartment that is built into the RV undercarriage or belly. They are larger than their portable counterparts and are often integrated with automatic switching panels that will transfer the appliances inside your RV from mains power to generator power if mains power fails. A good choice for powering small devices or run in parallel and power your AC. This can come in handy when you are using your RV at a camping ground or race track, and the public RV power supply system fails. In that case, the power will instantly switch over to your fixed generator, just like your home switched over to backup generator power when the mains line goes down. So basically, an RV generator differs from a conventional generator in the sense that it delivers cleaner power, is more efficient, and makes much less noise. If you come to think about it, efficiency and noise levels take a backseat while designing a generator for some application which has no space constraints, noise level regulations, or fuel limitations, such as a job-site. With a RV-generator though, you are carrying the generator with you and cannot afford to ruin the whole touring or camping experience with a super loud machine running in the background. Also, fuel efficiency is extremely important since you can only carry so much fuel while traveling in the RV (it is not an oil tanker, right?). Besides, appliances such as lights, air conditioning, and the refrigerator will probably be running almost 24×7, so efficiency is even more important. This is not like your home backup generator which turns on like twice a month when the main power grid fails. When you go on a long road trip to some other state, or when you go boondocking into the beautiful wilderness several miles away from civilization, there are no gas stations or power outlets lying around nearby for you to use. So, you naturally need to make sure that every single drop of generator fuel that you are carrying with you is used efficiently. Inverter generators put much more focus on quiet operation and efficiency compared to regular generators. That is because inverter generators can modify their engine speeds to accommodate for the changing load – something that conventional generators cannot do since they have no inverter circuitry installed. Inverter generators combine an inverter and a generator into one unit – they first make low voltage (12V) DC current from the mechanical energy that is generated by the engine. Then the inverter module steps up this DC power, transforms it into AC, and filters the waveform to make sure that the output consists of pure sinusoidal AC current. In case you didn’t know, all modern electronic appliances are designed to run on sinusoidal AC current, and using impure AC current will result in shortened lifespans as well as decreased efficiency and overheating. This is especially true for delicate electronic appliances such as the TV, computer, mobile phone, etc. The washing machine, AC, fridge will all manage with less-pure AC, but you need to make sure that you use either mains power from the walls or inverter generator power for the delicate appliances such as PC, TV, mobile devices, etc. Any portable inverter generator will make a nice RV generator, but you will also find manufacturers marketing certain models as “RV class”. What this means is that these “RV class” generators are designed with special engines that generate up to 3 times more horsepower than their conventional counterparts. What this allows them to do is run at lower rpms. While running at lower rpms, the engine still generates the same amount of power as the engine in the conventional generator would have made at a much higher rpm. Low rpm levels keep noise low, and decrease emissions – another key factor while running a generator in confined or closed spaces. The generator apartment in your RV will surely have its own built-in exhaust ventilation system but that is still no excuse to stuff a model in there that generates tons of fumes while running. Too much fumes can cause carbon monoxide poisoning and pose health concerns for people with respiratory issues. To power your RV air conditioner you can run two in parallel. How much power do I need? (Very important). Which fuel will my generator use? Depending on the number and type of appliances that are installed in your RV, you could get by with as little as 1500 watts of power, or might end up needing a monstrous 5000 watts of juice to run everything in tandem. Too much power, and you will fry every circuit in the RV. Too little, and you will end up with a situation in which you cannot run the water heater while the fridge is on, or the inability to use the TV while the AC is working. Once you solve the power puzzle, the next step is determining what type of fuel your generator should use. The two most popular types of fuel for portable RV generators are gasoline and propane. Propane is easier to store and is better for the environment, but the quantity of propane that you can carry is limited by the size of the propane tank, and it also burns faster than other types of fuels such as diesel or gasoline. Gasoline is cheap, generates more energy than propane and burns faster than diesel but is also harder to store. Finally, you need to consider how much sound you can tolerate. Again, that will depend on your usage and personal preferences. In general, inverter generators produce between 52 to 59 Db of noise, as compared to the 65-85 Db of conventional generators (RV class generators produce less than half the noise of conventional generators as a 10dB difference in sound levels equates to a 200% shift in magnitude). Prepare a table with four columns – Name of Appliance, Number of Units (per appliance), Starting Wattage, and Running Wattage. Find out the appliance with the highest starting wattage in the entire list. For an RV, this is almost always guaranteed to be the Air Conditioning system (13,500 BTU or 15,000 BTU). Now, add up all the running wattages for the appliances that have zero starting wattage requirement, which should be anything without a motor (for appliances that have more than one unit installed in the RV, calculate the figure by multiplying the number of units with the appliance wattage requirements). Add the highest starting wattage with the sum of all the appliances that have zero starting wattage. This should give you the peak power output of your generator. To calculate the running power draw, just add up the running wattages of each appliance (multiplying by number of units installed wherever applicable). To give you a rough estimate, an RV with a 13,500 BTU AC will probably need a 3000W generator, and a RV with a 15,000 BTU AC will need at least a 3500W generator. That is of course, if you don’t turn on any appliance simultaneously with the AC. Fridges (6-7 cubic foot capacity) should consume about 600W while starting up, and around 200 watts under load. A double door multilevel refrigerator with advanced features might consume 400 watts under load and need around 1Kw (1000W) to start up. A countertop electric grill should need about 1500 to 1700 watts, and a microwave oven (countertop model, 1 cubic foot capacity) should be fine with 1000 watts of power. The 13,500 BTU AC in your RV is going to consume the most power of any appliance, and will probably have a running wattage of about 1500 to 2000 watts. For a 15,000BTU AC the starting wattage will be a little higher but running wattage is still the same. A TV should take no more than 200 watts, while a personal computer such as a laptop should be fine with 150 to 250 watts of power. If you are using a couple of 100W light bulbs and a few CFL lamps/tubes, we shall allocate about 300 watts for lighting, meaning that a 3000-watt portable RV generator is more than enough to run a 13,500BTU AC, about 3-4 lights, a personal computer, and the TV. If you wish the run water heater and fridge as well, or the electric grill and microwave, you will probably need to pair a couple of 2500W units together, or get at least a 4000W inverter generator (those are rare). We suggest getting a fixed RV class generator if you are a power user with a lot of stuff to run at the same time. Diesel is the best in terms of clean burning and energy emission, but is also not suitable for smaller engines and has a shorter shelf life. Liquefied Propane (LP) is the most environment friendly, just like natural gas but it cannot be stored in conventional containers hence you are limited by the size of the propane tank in your generator, even though propane has a very long lifespan and is quite stable in storage. It has about a 10% lower energy yield than gasoline or diesel though. Gasoline is the most popular fuel of all three, thanks to its cheap price, fast burning nature, and the fact that it can be easily stored in containers, so you can carry more gasoline with you than you can carry propane. Propane produces about 91,500 BTU’s of heat per gallon while gasoline produces about 125,000 BTU’s per gallon. Gasoline has a shorter expiration date and should not be stored in the house, RV, or garage. Most RV generators are actually slightly modified inverter generators, and hence emit very little noise in comparison to conventional generators. For example, the average RV/inverter generator will output about 52 to 59 decibels of noise. This is less than half of the average noise output range for a conventional generator, which is around 69 to 80+ decibels. Just so you know, anything higher than 85 decibels is acceptable only at construction sites or large factories since it is approaching rock concert and jet take-off levels of sound. A 10 decibel increase in sound output signifies twice the amount of noise (since the decibel scale is logarithmic instead of linear), so be careful when taking decibel numbers into consideration while deciding which generator to buy. When manufacturers conduct their sound testing, they usually run the generator at a load between 50 to 75% and record the loudness at about 21 to 23 feet from the generator (around 7 meters from it). Portability is a big deal when you want to use the generator for more than just your RV. You must unload and reload the generator whenever you stop at a camping site or park, because you are obviously not going to run the generator inside your RV unless you have a dedicated exhaust ventilation system installed specifically for the generator. Every time you load and unload the generator, you will understand the importance of having a smaller and lighter generator, because you will be the one doing the heavy lifting. Look for generators with top-mounted carry racks or handle bars and folding arms for towing. Rear wheels are great for pulling the generator around like a trolley. 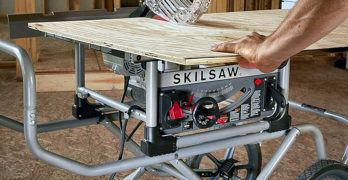 Also, look for padded grip rails so that two or more people can haul the generator from the back of a truck or deck of a RV. Finally, look for features that enhance the user experience and simplify the operation of the generator as well as its maintenance. An example of a user-friendly feature is remote start – so you don’t have to walk out of the RV in the middle of the night to turn the generator on or off. Another feature that could come in handy is touchscreen based control panel and indicator LED’s that inform you about the status of oil and fuel so that the generator does not overheat or damage itself. Automatic safety shutdown and smart load monitoring are all great features to have, along with auto-fuel shutoff safety valves and multiple outlets (120V outlet, 12V outlet, USB outlets for your phone, etc.). Ultra-portable with large wheels and large handle. ✓ View or download the MANUAL for the Champion Power Equipment 75537i. Purchase Includes: Oil funnel, Spark plug socket, Wireless remote, 12V DC charging cables, Batter, USB adapter (Automotive style 2.1A and 1A ports). Champion generators are usually some of the most well-built and neatly designed pieces of power generation equipment that money can buy. And the Champion Power Equipment 75537i is no exception either, it offers one of the best power to noise ratios in the entire industry, almost as good as a slightly more expensive Honda generator of the same class. Few 3100 watt portable generators are this quiet, and this lightweight. Firstly, it generates only 58 dBA of noise (measured at a distance of 23 feet) under load, and on top of that the net weight is just 96.6 lbs (43.8 kg). How Champion managed to fit a stainless steel chassis and 171cc four-stroke gasoline engine into such a compact (25.1” x 17.3” x 18.3” in L,W, and H) is beyond us, however we do know one thing – the combination of a small body and light weight makes this one heck of a portable generator. It also comes with radial wheels on the rear and carry handles on either end of the upper body so that two people can conveniently lift and move this generator, with each person holding one end of the generator. It is perfect for usage in an RV due to its efficient nature and silent operation. The best part about it happens to be the inclusion of a remote start feature, one that is not normally found in generators at this price range. It is priced under 1300 bucks, yet is loaded with a slew of user-friendly features that make the overall end-user experience much more enjoyable and seamless. A user can choose to go with the recoil start, electric start, or wireless remote start. To understand why you would need three different types of starting mechanisms alone, consider the various situations in which you plan to use the generator. Let’s think about the first case – an extremely cold environment or a winter morning in a hilly region with lots of snowfall. In this scenario, the push button electric start might not succeed in starting up the 171cc 4-stroke single cylinder OHV engine, which is why you will have to put those hands of yours to work by tugging the pull cord, aka recoil start. In most cases, you will not need to pull more than once, thanks to the excellent engine design and automatic choke system. For the second scenario, let’s have a rainy night or stormy evening. Or even a rainy/stormy day with lots of rain and wind being thrown around. You have the generator planted 15 feet outside the RV, because of course nobody uses their generators inside a closed RV in which case they would be risking carbon monoxide poisoning. Now, do you wish to walk out of your comfortable seat while you are watching a movie and drinking your favorite beverage, only to get yourself drenched in rain for turning on the generator? Well of course not, that’s why you are given a remote start system, just press the button on the remote from as far as 30 feet away to instantly start the generator. And finally, you have the electric push button start if you like to get things done up close and personal, it starts the engine within a couple of seconds without any fuss. Before we move on to the next model, let us take a final look at the various reasons which make this Champion a fine choice under the 1300 dollar range – it is silent at 58 dBA, light at under 97 pounds, has an extremely versatile arsenal of starting mechanisms (remote start, cord pull, electric), and comes with dual carry handles as well as wheels so you can conveniently load it onto the back of your truck for those tailgating parties, or you can immediately get it on and off your RV with minimal effort for those weekend camping trips and holiday getaways. Running wattage is 2800 watts – you can comfortably run a 13,500 BTU AC and still have room to spare for a RV refrigerator. Or, you could run a 13,500 BTU RV AC and watch the TV at the same time while also charging your phone and doing work on your laptop with the lights on in the night. Or, you could just run a single appliance like a monstrous 15,000 BTU AC. Enough power to start a standard RV air conditioner. Ultra-Quiet : Engine speed adjusts automatically, further reducing noise, fuel consumption, and emissions. StatStation LCD Display : Easy-to-read LCD screen shows the amount of power being used, total unit hours, and maintenance reminders, including oil, air filter, and spark plug changes. Easy portability : Designed with wheels (6″) and a twin handle with luggage-style telescoping functionality. 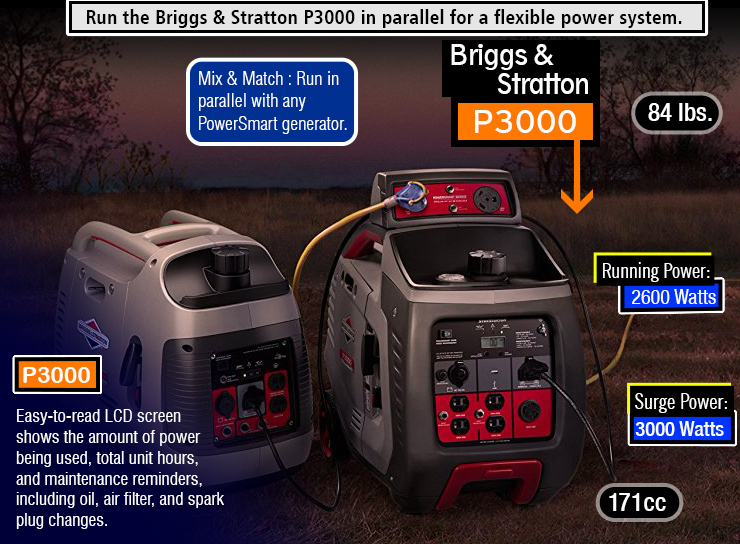 Briggs and Stratton have something truly special with the P3000 portable inverter generator. It is not specifically classified as “RV class”, but is instead categorized as an all-purpose inverter generator that can power everything from the 13,500 BTU or 15,000 BTU AC in your RV, to the electric grill and countertop microwave oven in your house when the power goes down. It is hard to say that this generator is best used for any particular scenario because it possesses all of the qualities that define a great RV generator as well as portable home backup generator, heck it even makes a fine tailgating and camping generator owing to its silent operation and compact dimensions as well as low weight. It features a starting wattage of 3000 watts and outputs 2600 running watts which should be enough to start and run any RV air conditioning system up to 15,000 BTU in capacity. Once you have the RV AC running, you should still have about 800-1000 watts left over, which can be used to run any of the remaining appliances in your RV such as the TV, fridge, laptop, or even a compact 0.5 to 0.8 cubic foot capacity microwave. Remember that you should not try using anything more than the RV fridge and AC together if you have 2600 watts of running power. Perfect for powering your RV air conditioner. Flexible power when you need it. Overloading the generator will damage it and might even permanently take out some important circuitry inside your RV or the appliances that you’re using. A TV and laptop combo will consume no more than 500 watts combined, add in 3-4 lights and you have a total usage of about 700-800 watts. This is enough for the average RV user, assuming that you own a fuel operated stove and grill in your RV. If you plan on running an electric grill, microwave, bathroom water heater, TV, fridge, AC, and lights all together, then we suggest using the parallel connector port to hook up a second P3000. This is because you will not find the same quality of “clean sinusoidal AC current” in a conventional generator, even though they offer more watts per dollar spent. Finding a 4000 or 5000 watt inverter generator is very hard, since most of them are designed to run limited number of appliances at a time, and do so efficiently and quietly. However, if you feel like you need to take all the comforts of a modern home along with you on those weekend boondocking trips or camping rides, then we suggest buying two of these fine machines and running them in parallel. You see, that is something only inverter generators can do – conventional generators don’t come with a parallel running port for you to hook up two of the same units together. Easy to carry with the built-in handles and wheels. And the parallel running port is something that is absent on this units closest competitor – the Champion 75537i. But hey, it still has remote start! One of the cool things about this model is the StatStation LCD readout display that lets you monitor the load, oil reserve, total hours run, spark plug status, air filter maintenance status, etc. in a single LCD display. While the Champion 75537i had dual carry handles on the top and wheels in the rear, the Briggs and Stratton P3000 takes that concept one step further by introducing luggage style telescopic handles. So, the Briggs & Stratton P3000 may lag behind the Champion 75537i in terms of watts generated and starting mechanisms, however it more than makes up for that deficiency with superior portability, better stat monitoring (via the StatStation LCD display), and the presence of a much appreciated parallel operation port. Clean power : Produces 3100 surge watts and 2800 rated watts. 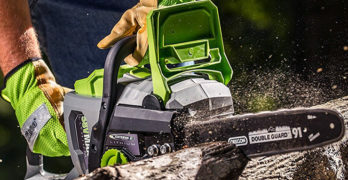 Since we’ve already looked at two mid-range portable generator offerings from both Champion Power Equipment and Briggs & Stratton, why not talk about another contender, this time from one of the oldest and most innovative power generation equipment manufacturers in the entire Western Hemisphere? Yes, you guessed it right. We’re talking about none other than WEN – these guys have been designing and manufacturing excellent power generation equipment since 1951, and each year they bring something new to the table. WEN doesn’t simply look at what other guys are doing and make it better, rather they come up with something truly unique and unheard of previously in the industry. And the WEN 56310i portable inverter generator is proof of that philosophy – a 3100 watt portable inverter generator for under 700 dollars. The perfect size for your RV needs. Let that sink in for a while – less than 700 dollars. Yes, a 3100 watt portable generator just like the near 1300 dollar models from Champion and Briggs & Stratton, the 75537i and P3000 respectively. So, how come WEN’s 3100 watt generator is almost half the price of these two? Trust us, those two (the 75537i and P3000) are not bad at all, else they would have never made it to this list, rather they offer a lot more than just raw watts in the form of advanced sensor based load monitoring, stats display on LCD’s, user friendly operation and high amounts of portability as well as efficiency. Not saying that the budget WEN generator is not efficient or silent in operation, rather it is not optimized with those aspects in mind. This is for people who are just getting started out with boondocking, tailgating, or camping, and don’t go out every other day on such trips. It is for the people who like to enjoy a visit to the race course in their RV on weekends, or the people who go camping with the family once in a month. This generator comes with voltage regulators to deliver clean sinusoidal power, free of voltage spikes. One of the really impressive things is the fact that even though this generator was not optimized for silence, it still manages to output just 57 decibels of noise from 23 feet under quarter load (25% of rated load). Now, at first glance you may think “Oh, but the Champion model outputted 58 decibels under load os this is both cheaper as well as quieter!”. Well, not exactly. You see, not every company mentions how they carried out the test, even though WEN clearly states that they use 25% load and measure from a distance of 7 meters. Upon doing some digging around, we found out that the Champion 75537i is rated for 58 decibels under 50% load – meaning that it is almost half as noisy as the cheaper WEN counterpart. Both of these models generate a starting power of 3100 watts, and have a running wattage of 2800 watts. The WEN packs a larger engine, a 212 cc 4-stroke OHV that combines with the 1.85 gallon fuel tank to deliver over 7.5 hours of run-time under 50% load. The front panel is loaded with two 3-prong 120V receptacles, a single 120V 30A AC NEMA twist lock receptacle, one 12V DC receptacle, and dual 5V USB ports for charging your cellphone or external battery bank. It is also portable, thanks to the compact size and dual carry handles on the top, along with a folding front handle and rear wheels for towing. Need more than 5000 watts of power? Well, just use the parallel connection port to hook up two of these bad boys together and enjoy your ultra-clean, silent power! Can power most 13,500 BTU RV air conditioners. Honda is widely regarded as one of the best, if not “the best” power generator manufacturers on planet Earth. There are several reasons for that- their highly efficient and super silent engines (that other companies use more than Honda themselves), their ingenious body design and intuitive control schemes that are super user friendly and easy to operate, their compact size and long run-times, and many more reasons. But we are here to discuss a very specific model from Honda, the EU3000iS. This is an excellent source of power backup for any RV AC, be it 13.5k BTU or 15k – the EU3000iS will comfortably handle it with the 3000 watts of surge power and 2800 watts of continuous wattage. Notice something? Most 3000 watt inverter generators usually have a continuous wattage of 2500 or 2600 watts if their surge wattage or starting wattage is 3000. This is because the surge wattage is the amount of power that the circuitry within the generator can tolerate for a short burst – not intended to be run at that power level for more than a few seconds. This surge power is useful for starting up appliances like air conditioners and refrigerators which utilizes some form of high current motor, like in a compressor. These motors have high starting torque and need lots of power to spool up. 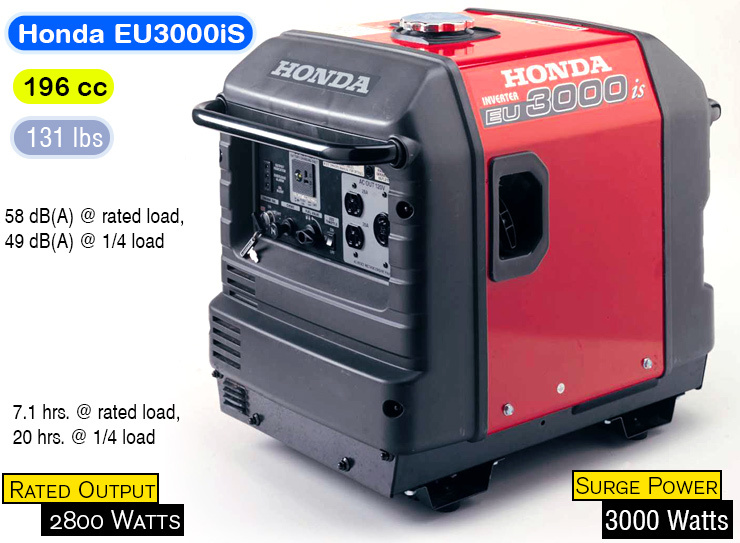 We are genuinely impressed by how close the surge power is to the rated continuous power in this Honda generator, meaning that both its engine as well as voltage regulation and inverter circuitry is made from top-quality components. Fuel tank capacity is a massive 3.4 gallons, which results in a 20 hour run-time under load – perfect for scenarios in which you don’t want to refill the generator every now and then. This is the perfect machine for supplying backup power to important home appliances in an area where power cuts occur frequently, and can last for 20 hours or more. If you put this run-time into perspective, it is more than twice of what the other three generators on this list offer. Meaning that this Honda generator should be bigger than the other three since it has a fuel tank that is more than twice as big as the ones on its competitors, right? 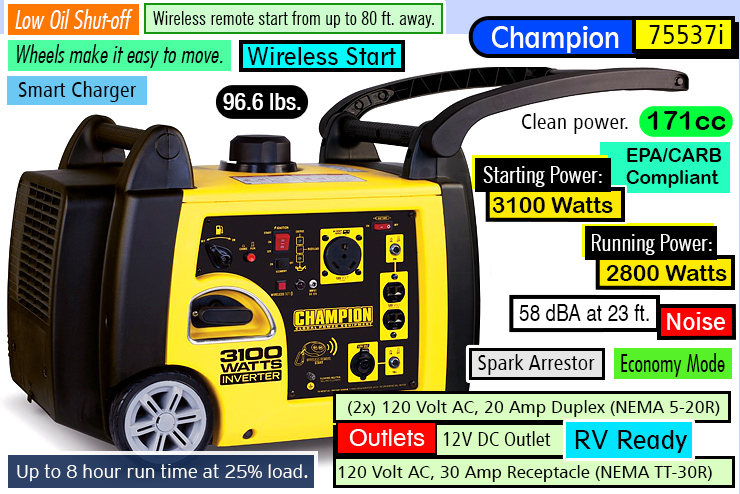 Well, no – the dimensions of this super portable inverter generator are just 17.6” x 22” x 26” (Depth x Height x Width), meaning that it is actually smaller than both the Champion 75537i as well as the Briggs & Stratton P3000. However, it does weigh significantly more than its counterparts at 131 pounds, so there is a slight compromise when it comes to weight. The fixed carry handles are offset to the sides instead of the top- a brilliant way to make carrying this generator much easier despite its higher mass. There are parallel operating outlets positioned conveniently on the front panel so you can hook up another EU3000iS and get up to 5600 watts of continuous power if you wish to power every single appliance in your RV simultaneously. Both Easy Electric Start (push button) and recoil start are provided for redundancy, and the noise levels are the lowest among any portable RV-class generator we have ever tested – just 49 decibels at 25% load (quieter than a normal conversation in a room). Noise output is 58 dB at rated load, and the engine used in this beast is the 196cc 4-stroke OHV single cylinder Honda GX200. Whew! We truly hope that you found this article informative. We’ve spent a lot of time researching so you don’t have to. Choosing the best RV generator can be daunting if you don’t understand what factors to consider.